Carl B. Kaufman, 89, formerly of Elizabethtown, PA, passed away on December 5, 2017 at Moravian Manor, Lititz, PA.
Born in New Cumberland, PA, he was the son of the late Jean Coulson and Mercedes (Beshore) Kaufman. He was the loving husband of Lois (McMinn) Kaufman to whom he had been married 63 years. Mr. Kaufman graduated from New Cumberland High School in 1946. He served honorably in the U.S. Army from 1946-1948 with basic training in Fort Bliss Texas and then was sent to Fairbanks, AK to serve in the 947th Army Postal Unit. He graduated from Elizabethtown College in 1952 with a B.A. Degree in English and History; Temple University in 1958 with a M.Ed Degree in Administration and Secondary Principal’s Certification. His teaching career began in a two room school at New Providence Elementary School where he taught grades 5-8 from 1952-54. Continuing in the Solanco School District, he also taught upper grades through 1956. The remainder of his teaching career was in the Warwick School District. From 1956-64 he taught English and Social Studies at Warwick Junior and Senior High Schools. 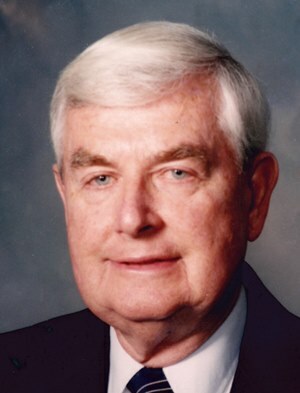 He was elected English Department Head in 1963; Junior High School Principal in 1964, Assistant Superintendent in 1969, and finally Assistant Principal of Warwick High School until his retirement in June, 1986. Following his retirement he became active in alumni activities at Elizabethtown College including President of the Alumni Council, chair of the Elizabethtown/Mount Joy Alumni, Chapter Steering Committee, chair of the committee of Alumni Chapters, chair of the class of 1952 reunion planning committee, and a member of the executive committee of the Alumni Council. He was a member of Masonic Lodge # 682 F. & A.M., 32nd degree; Reading Consistory and Valley of Lancaster Scottish Rite. He was also a member of the American Association of School Administrators and was a former member of the Pennsylvania Education Association and the National Education Association. He was an active member of Lititz Church of the Brethren and its Friendship Sunday School class. In addition to his wife, Lois, Carl is survived by three children: Debra L. (Kevin) Carpenter of East Petersburg, PA, Doug Kaufman, and Dean M. Kaufman of Harrisburg; one brother: John R. (Antoinette) Kaufman of Glen Mills, PA; and three grandchildren: Kaitlyn Kaufman of Charlotte, NC, and Amy and Carl Carpenter of East Petersburg, along with several cousins, nieces and nephews. Relatives and friends are respectfully invited to attend a Memorial Service on Saturday, January 6, 2018 at Lititz Church of the Brethren, 300 W. Orange St., Lititz, PA 17543 at 11:00 a.m. The family will greet friends at the church from 10:00 a.m. until the time of service. The family would like to express its gratitude to the staffs of Moravian Manor and Hospice and Community Care for the excellent care they extended toward Carl and his family. Sorry for the lost of this caring man, the world is a better place because of him. I was a student of Mr. Kauffmans at Providence school. Mr. Kauffman was one teacher who was interested in helping me to do my best. He was a very caring man who went out of his way to help solve problems that were not school related. Always giving good advice . Outstanding instructor. My sympathy to Lois and the Kaufman family. I was a student at Providence Elementary when he started to teach. That was 5th grade for me. I also attended their wedding along with a few other 5th grade students and the teacher that taught 1-4 grades, Mrs Winona Newswanger. I am sure all will miss him. I was so sorry to hear of Mr. Kaufman’s passing. He was the assistant principal when I was in school, and I loved him dearly. While he could be a bit stern (a trait needed by principal’s! ), I learned over time that he definitely had a sense of humor, and most of all, he had kindness in his heart that extended to all students. I was lucky enough to run into him several years ago, and he remembered my name (not sure if that’s a good thing :)). I will always remember him fondly!! Prayers to your family! Lois, Debra, Doug and Dean, and family, Please accept our sincere condolences for the passing of Carl. We shared many meals at the famous Beshore Reunion together at Shady Maple. We will miss Carl’s intriguing manner of conversing with each of us. I know Carl shared a great love for my mother Betty Oates. Peace to all of you. I am one of your former neighbors from Oxford Drive, Lititz. Last time I saw you and Carl was at Garth Becker’s funeral service. I am not able to attend your service for Carl on Jan. 6th and wanted to send my sympathy to you and your family – Not having an address left me this option of letting you know my prayers are with you and your family. thinking about you. We are sorry for your loss. Elizabeth Hughes and the card club. Actually it has folded now that you aren’t here to run it. Dear Lois, I so clearly remember knowing you since I was a teen. I had your husband as a teacher at Warwick, I babysat for your family, and we kept in touch over the years, especially through class of ’61 reunions. I am so sorry for your loss and I know you will miss Carl so much. Please know I care about you and the kids. Hope to see you all at the memorial service in January. Dear Lois, I am so sorry for your loss. Mr. Kauffman hired me at Warwick, for which I have been grateful. Please extend my sympathy to your family.